Today I added a new performance benchmark to the chemkit library. The new benchmark, called uridine-minimization, measures the time to perform an energy minimization until convergence on a uridine molecule using the UFF force field. 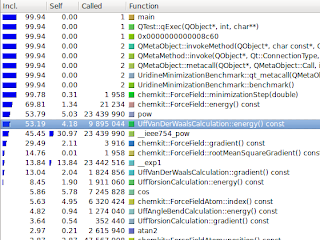 After running the benchmark through a profiler (I used callgrind from the valgrind package) I found some pretty interesting results and a potential easy performance optimization. 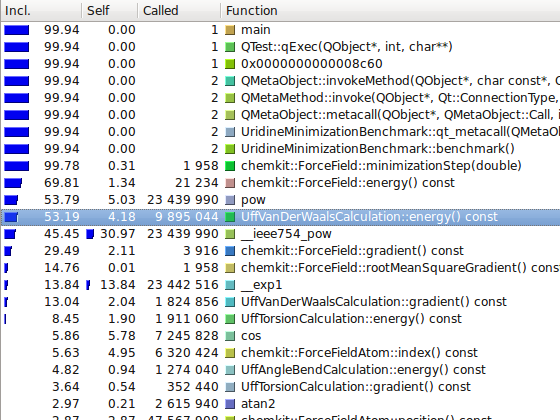 We see that 53% of the total time the program is in the UffVanDerWaalsCalculation::energy() method and, of that, 85% of the time is spent executing the pow()function. 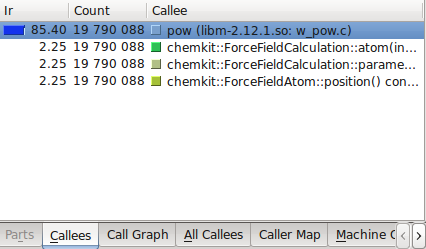 A potential optimization is to remove the pow()function call and replace it with a manual calculation of the two exponent terms. We see that the unrolled version is significantly faster but introduces a mean relative error of ~1.3e-16. Instead of manually optimizing the code, it would be great if we could get the compiler to optimize it for us. Looking through the g++ documentation turned up the -ffast-math compiler flag. It claims to increase the performance of floating-point math at the expense of breaking IEEE floating-point compliance and potentially reducing accuracy. So we can see that using the -ffast-math flag enables the same optimization that we performed manually. Using the -ffast-math option increased the speed by 88%, an even bigger improvement than just manually unrolling the pow() function. For now I will leave the unoptimized energy function and let the user choose if they want to trade speed for accuracy by passing the -ffast-math compiler flag when compiling. I found this answer on the Blue Obelisk eXchange interesting and, from the comments, seemingly controversial. The answer states that in Python using try/except with an assert could be faster than just an if statement. Intuitively I felt that try/except would be much slower than a simple if statement but I wanted to know for sure. So I opened my editor, wrote some code, and found out which actually performed better. I used the chemkit library's Atom::isHeteroatom() method to perform the counting of the heteroatoms. For the timing I used Python's timeit module. 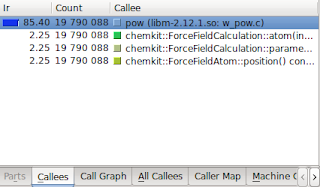 The code reads the 753 molecules from the MMFF validation suite's test file MMFF94_hypervalent.mol2 and then uses the timeit.Timer class to measure the execution time of counting the total number of heteroatoms. So we see that the if statement version is roughly twice as fast as the try/except version. That was my intuition, but it's good to be sure.